CHARLOTTE, N.C. -- Creativity, innovation and a commitment to leadership are just some of the distinguishing marks that identify the organizations selected for the 2015 Duke Energy Power Partners award. The winners are recognized for their responsible energy use, and creating lasting value for their organizations and the communities they serve. "We are pleased to recognize these organizations for their wise use of energy," said Chris Edge, Duke Energy vice president for large business customers. "It's exciting to collaborate with them and witness firsthand how they add value to their customers and their communities." 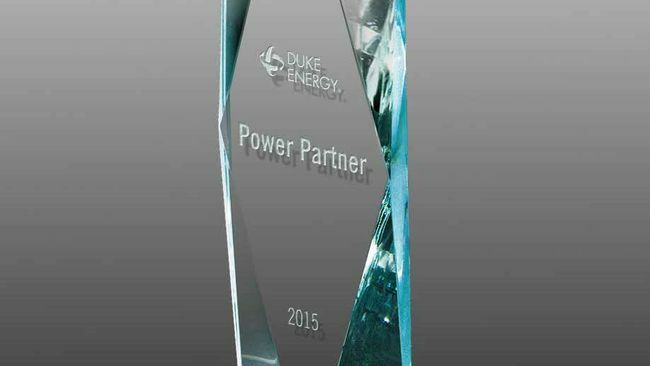 Duke Energy established the Power Partner awards in 1992 to honor businesses and other entities that achieve exemplary results in energy efficiency, sustainability and business growth. Each of the 2015 Power Partners will be recognized at individual award ceremonies this winter.